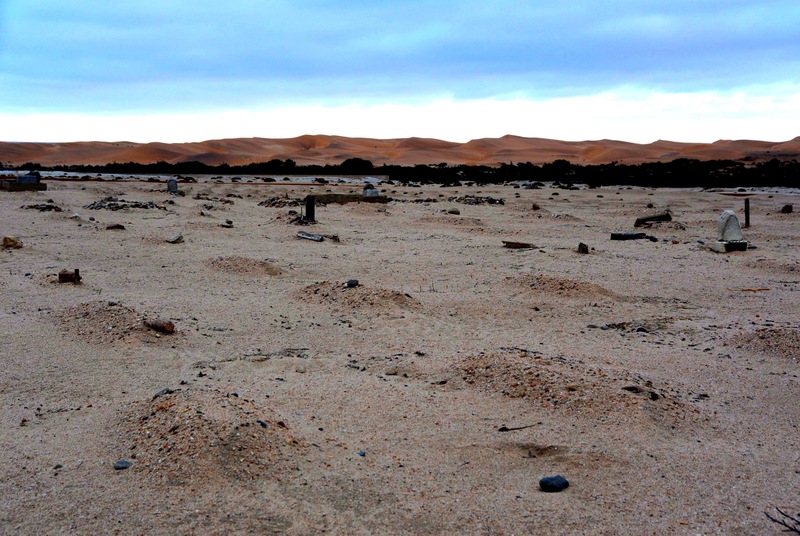 There is a buffer of land, between the dunes of the desert and the last streets of the affluent white residents of Swakopmund: a cemetery. One-tenth is modern. Tall palms are planted between neat plots with stately carved marble stones and benches and plants that are watered daily against the arid heat. There is a field of mounds enclosed by the same wall, ten times the size of the modern plots, keeping the desert at bay. There are no paths or plants or benches. There is one large stone marking the graves that have been abandoned. Maybe these dead are not important. Maybe these dead are an embarrassment. Maybe these dead are forgotten. 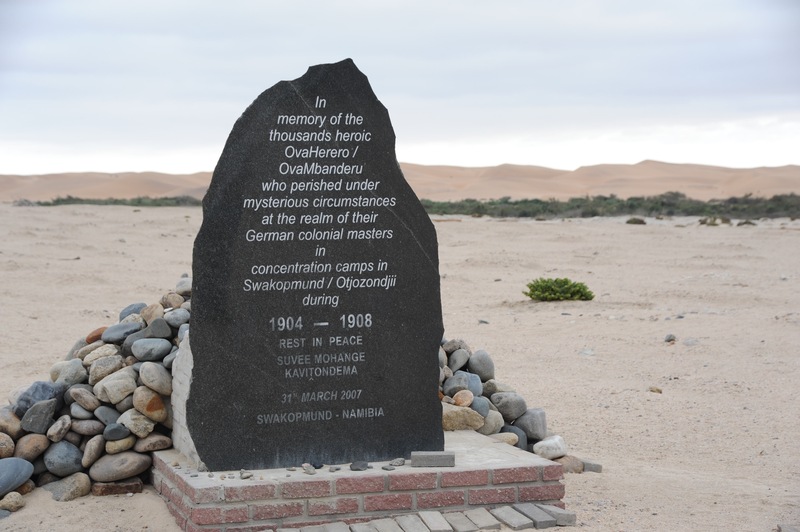 They are the resting places of the Herero who were “disappeared” during German colonialism at the beginning of the 20th Century. The Herero, the indigenous people of the land when the German arrived, called the “disappearing” a Genocide. It was. People who live on the street do not even know the graves are there. We asked. No, they said. That is the town cemetery. We don’t know about Herero graves. They do not look over the wall. But dead are here. Silent. Murdered. This place is not in a guide book, not on the maps. Our Namibia friend, Ferdinand, whom I’ve known for more than 30 years, brings us here. It’s important. People need to remember. As the Germans colonized Namibia in the early 20th century, there were people in the way. It’s a story American native people know too well. The Herero know it too. They were rounded up by the thousands and placed in… wait for it… concentration camps. Jews and Gypsies can pick up the story from here. The Herero were killed in the camps. Experimented upon. Butchered. Eliminated. Buried in the sand. By the tens of thousands. The colonists wanted the land and the people who already lived on it, in peace, said, “yes, we can share.” The colonists said what colonists always say. NO. Row after neat German row. A mound. Then another. And another. For acres. A way of life was wiped out; 85 percent of the Herero were killed or left to die in the desert. Many people have forgotten about this holy place. We will not. Hannah suggested we add a stone to the collection at the primary marker, as is our custom when visiting a grave. It’s a reminder that the person has not be forgotten. I’m sorry I didn’t think it first. We will remember them. The cemetery is on the edge of the city, where civilization meets the sand, the dunes, timelessness. There is silence, except for the crash of the surf in the distance, the wind in my ears, and the pad of my sandal on the sand. I step lightly, careful not to step on a grave. I cannot help but wonder: were the Nazis were so efficient in killing Jews because their fathers practiced on the Herero a generation earlier? Postscript: We visit the modern part of the cemetery and happen upon Jewish graves. Dozens of them. Older than any we have seen. 1876, 1885. 1890. This is before the Germans. Jews were here. Many, many families. We wonder: what were their lives like here? I want to believe they were friends to the Herero. This entry was posted in Civil Rights, Inspiration, Judaica and tagged action, AFrica, genocide, heritage, Namibia, tradition, travel. Bookmark the permalink.